Stephanie Orlino, the Senior Manager for Public Affairs and Education Program Head of Smart Communications, Inc., has been in the field of community development with Smart for 14 years now. She has been focusing on crafting and implementing sustainable, community-based education programs. With her efforts to elevate education in our country with the aid of technology, she brought Smart to Fortune magazine with her SWEEP (Smart Wireless Engineering Program). It was cited magazine as one of the companies that makes a social and environmental impact through business strategy and operations. As an advocate for education, she firmly believes that education is not the just the responsibility of the teachers and the parents, but everyone. Also, she encourages people to take part in supporting and developing education in the country because it is our best root towards development, in all aspects. What are the education programs of Smart? Smart has a roster of programs from basic education all the way to tertiary. But ironically, back in 2003, they started with tertiary level. Stephanie Orlino together with her team wanted to aid schools with new technological advancements to enable communities. Thus, SWEEP (Smart Wireless Engineering Program) was organized and it has been running for 13 years now. The program aims to improve the level of technology and engineering education in the Philippines, particularly in the field of Electronics and Communications Engineering (ECE). They partner with different colleges and universities all over the country that offer engineering and information technology programs. SWEEP supports the partner schools by producing up-to-date content and equipment, as well as hands-on trainings, seminars and internships. Smart is aware that theories are strong and sufficient in schools; however, the application of what students learn are lacking. In most cases, what students study in books to what is happening in the industry is way different. Especially, nowadays, the industry of technology is fast-paced and change happens constantly. A lot of schools can’t keep up with these changes in technology. As a result, SWEEP embeds the same training in information and technology that their employees get to the students and teachers. Smart’s own engineers and personnel train the students and teachers to give the students not just theories but also first-hand experience. The topics that are included in SWEEP are very unique and practical compared to ones in the academe like 3G and LTE. Yearly, Smart holds awarding ceremonies to encourage innovation and excellence in wireless application development among the partner schools of SWEEP. This serves as a litmus test to gauge the acquired knowledge of the students and teachers. In like manner, it gives opportunity for the scholars to apply what they have learned to develop a wireless application. School teams and applications that have potential are turned into startup companies. And as of now, there are already four startups developed by SWEEP’s scholars. It is a 2ft x 2ft cart digital laboratory that contains tablets, laptop, projector, and pocket Wifi. It also comes with content; child and curriculum development, training, and monitoring. The cart costs 200,00 php. The project was inspired by the famous local education TV show “Batibot”. Their goal is to develop and enhance kindergarten literacy, ranging from alphabet to basic math, in public schools. Talking about technology for all and inclusive growth, urban areas should not only be the one who are prioritized. 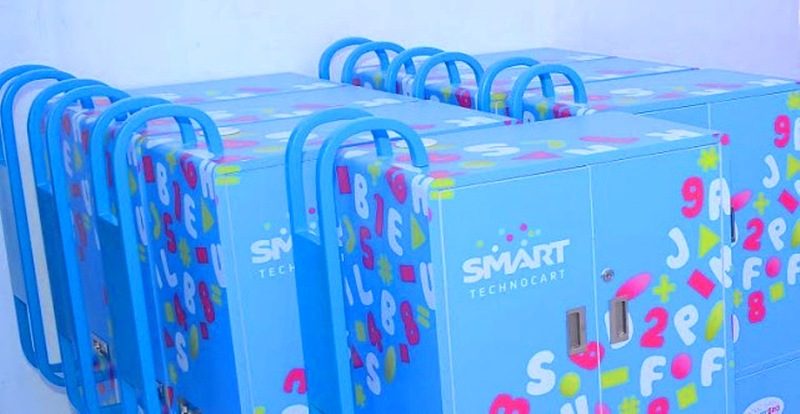 And because of “electricity barrier” in more than 300 remote areas in the country, Smart has come up with a project similar to Technocart. This project is called “School-in-a-Bag”. School-in-a-Bag is a learning tool package donated to public schools without electricity. 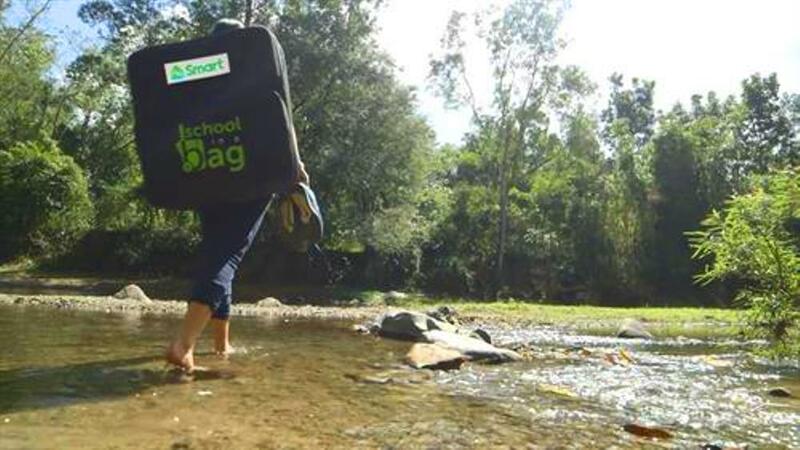 It is literal backpack that has solar panel, battery, LED TV, laptop, tablet, pocket wife and learning modules. Smart helps bring digital learning to remote communities by giving relevant content and engaging both teachers and students to updated innovations even they are far from civilization. Smart don’t claim to be experts in the field of academe. But they practice inclusivity and partnership and work with the experts, teachers, scientists and non-government officials. The programs of Smart don’t just aid schools to upgrade their technology because gadgets are very much accessible to everyone and primarily, technology is not their end goal. They aim to cater technology for all; to be a delivery mechanism that teaches students and teachers to use technology to enable individual growth, resulting to a larger scale development. The heart of their programs is putting together all the possible resources to deliver the right content, and capacitate the teachers to hand over sufficient and correct knowledge to students.